The federal Liberal government delivered their election-year budget yesterday. An election is scheduled for October 21, 2019 and this document highlights the Liberal re-election platform and messaging going into the campaign. Similar to the provincial budget delivered last year, anything booked for future years could be subject to change depending on who forms the next government. The government is delivering the budget in the midst of the SNC-Lavalin issue, that has resulted in a series of resignations and falling poll numbers for the Liberals. The federal budget deficit is predicted at $14.9 billion and rising to $19.8 billion next year. The budget includes $22.8 billion in new spending, but contains no plans to return to balance in the new future. A $9.8 billion budget deficit is projected for 2023-2024. The government is focused on the debt-to-GDP ratio, which will decrease in the years ahead assuming there is no recession in the near future. GDP growth is projected to average 1.8% over the next five years. The budget will provide incentives for new home ownership. The First-Time Home Buyer Incentive is an incentive that would allow eligible first-time home buyers who have the minimum down payment for an insured mortgage to apply to finance a portion of their home purchase through a shared equity mortgage with Canada Mortgage and Housing Corporation (CMHC). The total investment will be $1.25 billion over three years on the First Time Home Buyer Incentive. The budget will also increase the amount that can be withdrawn from RRSPs for a first-time home purchase by $10,000. The limit is now $35,000. The Canada Revenue Agency will work to increase efforts to enforce tax avoidance, money laundering and mortgage fraud. The stress test remains unchanged. These measures are designed to appeal to millennials and younger voters in the upcoming election campaign. The budget will help build 42,500 new housing units across Canada, with a particular focus in areas of low rental supply, through an expanded Rental Construction Financing Initiative. 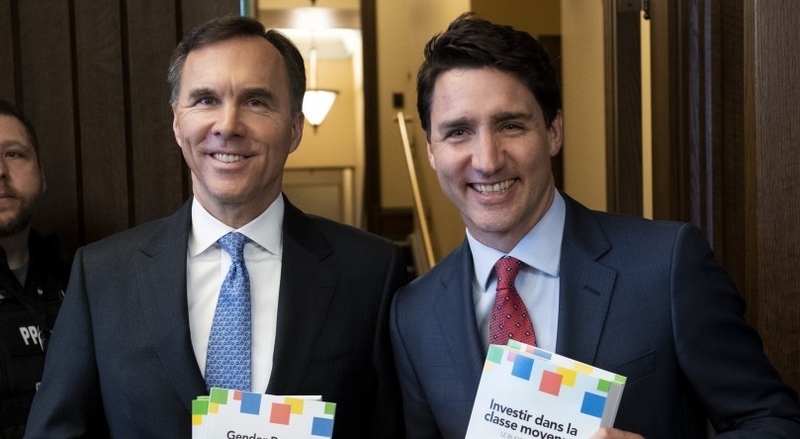 Budget 2019 makes available an additional $10 billion in financing over nine years, extending the program until 2027–28. There is nothing new in the budget for community housing beyond what was previously announced in the National Housing Strategy. The National Housing Co-Investment Fund has been launched, which is expected to help build 60,000 new units and repair or renew 240,000 existing units of affordable and community housing. Seven provinces and territories have signed bilateral housing agreements under the new multilateral Housing Partnership Framework. These agreements will see more than $7.7 billion in new federal funding flow to provinces and territories over the next decade, to support the stock of community housing and address regional priorities. Over the next year, important measures will be introduced to deliver on the Government's National Housing Strategy commitments. Reaching Home, a new $2.2 billion program to prevent and reduce homelessness, will launch on April 1, 2019, with the goal to reduce chronic homelessness by 50 per cent. Starting in 2020, a new, $4 billion Canada Housing Benefit will provide financial relief directly to those in core housing need and, over time, is expected to support 300,000 households. It is currently being co-developed with provinces and territories to ensure that the benefit is tailored to the diverse realities and needs across the country. The Federation of Canadian Municipalities will receive $1.1 billion through the Green Municipal Fund to help make large community buildings and affordable housing developments become more energy efficient. The government intends to go directly to municipalities due to complications in working with the provinces. The budget highlights previously announced initiatives such as the Canada Child Benefit that has helped lift 280,000 children out of poverty and is considered one of the highlights of the current government’s record. The Canada Child Benefit remains unchanged. $35 million will be used to create a Canadian Drug Agency as an early step towards a national pharmacare program in the future. A national formulary for Canada will also be developed as part of the Canadian Drug Agency. Prescription drug spending in Canada has risen dramatically over the last three decades, from $2.6 billion in 1985 to $33.7 billion in 2018. Canada’s current patchwork of drug coverage, which includes more than 100 public programs and 100,000 private insurance plans, is not well equipped to handle increasingly expensive drugs coming to market. The Canadian Drug Agency signals a plan to move forward with national pharmacare, however that has a projected $20 billion annual cost and would require provincial cooperation. There are also changes to the Guaranteed Income Supplement to allow seniors to keep more of their income if they chose to work. Budget 2019 proposes significant additional funding of $100 million over five years, with $20 million per year ongoing, for the New Horizons for Seniors Program so that it can continue to improve seniors’ quality of life and better promote their active participation in the community. The budget also proposes to introduce new measures to enhance the security of workplace pensions in the event of corporate insolvency. Seniors are considered a key voting demographic in any election. The budget introduces a new, non-taxable Canada Training Benefit to help pay for skills training. The Canada Training Benefit would give workers money to help pay for training, provide income support during training, and offer job protection so that workers can take the time they need to keep their skills relevant and in-demand. Eligible workers between the ages of 25 and 64 would accumulate a credit balance at a rate of $250 per year, up to a lifetime limit of $5,000. A new Employment Insurance Training Support Benefit would provide workers with up to four weeks of income support through the Employment Insurance (EI) system. This benefit, expected to launch in late 2020, would help workers on training leave and not receiving their regular pay cheque cover their living expenses, such as rent, utilities and groceries. $4.65 billion over five years will be invested in skills development. The government is attempting to address the changing labour market and help address the skills shortage and estimated 500,000 vacant jobs across Canada. The budget sets a goal for all Canadians to access high-speed internet by 2030 across the country. The government will allocate $5-$6 billion over the next 10 years to build out internet services that meet government standards to rural, remote and northern communities. The single biggest new investment in the budget is for Indigenous services, with $8.1 billion over five years being allocated towards improving health care, water on reserves and settling land claims. This budget prioritizes Indigenous issues and advancing reconciliation. The federal government highlighted its "historic investment" in infrastructure that has funded 33,000 projects and created jobs across the country. Budget 2019 proposes a one-time transfer of $2.2 billion through the federal Gas Tax Fund to address short-term priorities in municipalities and First Nation communities. This will double the Government’s commitment to municipalities in 2018–19 and will provide much needed infrastructure funds for communities of all sizes, all across the country. The government has been criticized for rolling out infrastructure funding slowly to date. The budget also contains some funding for gender equity, student loans, rare diseases, science and technology research, artists, cultural events, local media and electric cars. The budget also pledges to commit up to $3.9 billion in support for supply-managed dairy, egg and poultry farmers affected by recent trade deals with the Asia-Pacific and Europe. Health care does not get much of a mention. Corporations and small businesses saw no tax changes that would help address competitiveness. Some economists and the Conservative opposition were critical about the size of the deficit during times of economic growth and the lack of a plan to get back into balance in the budget document. The NDP was critical that the budget does not act quickly enough on issues such as affordable housing, child care, pharmacare and pensions. The media is covering it as an election budget designed to deflect attention from the SNC-Lavalin issues. This budget unofficially kicks off the federal election campaign. The writ is expected to be dropped in June with a fixed election date of October 21. It is possible the election could be called earlier. The current parliamentary session will end in June and the government will attempt to pass all their outstanding legislation before the campaign period. OMSSA will monitor election polls, platforms, candidates and issues as we move past the budget approval and into the unofficial campaign period. You can access the full budget document here.